The Sega Game Gear is an 8-bit portable system by Sega, designed to compete with Nintendo's popular Game Boy handheld. It is essentially a portable Sega Master System with a bigger color palette (although the screen resolution is reduced). Due to this shared hardware, many Master System games were also released on the Game Gear. Sega later released an adapter called the MasterGear Converter, which allowed Master System games to be played on the Game Gear. Unlike many video game systems the Game Gear does not have regional lockout, so games can be played on any system regardless of what region they were released in. 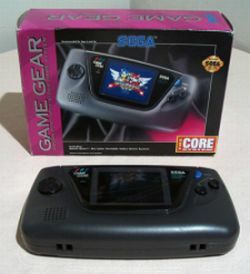 Sega ended support for the Game Gear in 1997, although other companies have since produced licensed variants of the hardware. Pages in category "Sega Game Gear"
This page was last edited on 26 April 2015, at 02:04.